Summit Springs Guard Station is located 2 miles off UT 44 on the upper side of Sheep Creek Geological Loop southwest of Flaming Gorge Reservoir at 8278 ft. in the High Uinta Mountain Range. The Civilian Conservation Corps built the complex in 1931 as part of Franklin D. Roosevelt’s New Deal. It was one of 11 guard stations built in the area to serve as homes for rangers who patrolled the forest on horseback prior to the modern age of vehicles. The complex includes the cabin, bunkhouse, parking area, and fenced yard. 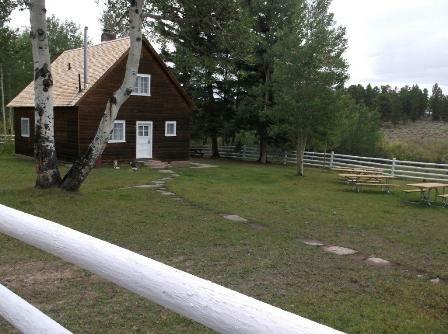 It is set in a rolling pasture, surrounded and interspersed with aspen and pine trees. Wildlife and summer flowers are abundant during the use season, mid-May through mid-September. The cabin will sleep eight on bunk beds and has a furnished sitting/dining area, kitchen stocked with pots and pans, and bathroom (two flush toilets and two showers). Propane is provided for the fridge, range, water heater, and heater. The bunkhouse will sleep 12 on bunk beds with heat provided by a wood burning stove. There is a large open area for up to four RVs or tents with access to a double vault toilet. There is a group gathering/eating area off the kitchen of the cabin with tables and fire ring. The maximum capacity for the complex is 40 people. Flaming Gorge Recreation Area is known not only for its beautiful red cliffs, but also for its world -class fishing for lake, brown, and rainbow trout. The dam is about 23 miles east of the complex. Sheep Creek Geological Loop, a scenic byway is a 10 mile drive through spectacular canyon scenery and millions of years of geologic history can be seen in this 20 minute drive, thanks to the Uinta Crest Fault and other rock features. The Town of Manila is about 15 miles away, off the north end of Sheep Creek Loop where visitors can find grocery store, restaurants, gas stations and other amenities. • Limited power is for lights only, provided via generator. No outlets are available for any other electronic appliances or items. • There is a $50 cleaning deposit due at check in. Funds should be cash or check (no credit cards) and will be collected onsite. The money will be refunded if the apartment passes inspection at check out time. From Manila, UT at the intersection UT 43 and UT 44: Turn south on UT 44 (between Forest Service Office and Brownings restaurant). Drive 13 miles to the upper (second) road to Sheep Creek Geological Loop. Turn right onto the Loop, drive 2 miles to FS 364, and turn left onto the drive into Summit Springs. From Vernal, UT turn north on US 191. Drive 34.8 miles to Greendale Junction. Continue onto UT 44. Drive 14.7 miles to the upper (first) road to Sheep Creek Geological Loop. Turn left onto the Loop, drive 2 miles to FS 364, and turn left onto the drive into Summit Springs.